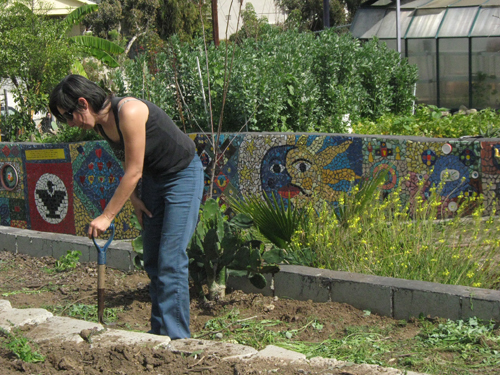 Located in the center of an urban wilderness, Proyecto Jardin is a community garden that has been helping residents in Boyle Heights get in touch with Mother Nature. 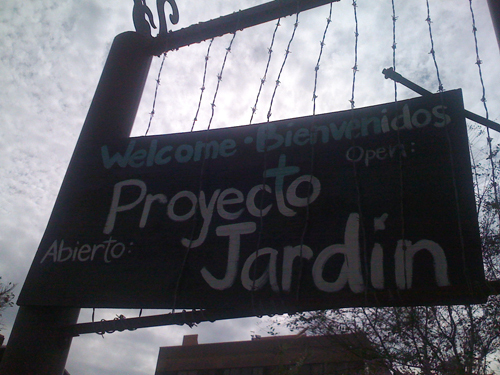 Located behind White Memorial Hospital, Proyecto Jardin is operated by community residents who donate their time and unique skills to the garden. Dr. Robert Krochmal, a doctor at White Memorial, came up with the idea to use the plot of land behind the hospital that was a community eye sore full of decrepit houses. After the hospital reviewed and approved the plans the land was cleared out and prepared so that construction for the garden could take place. 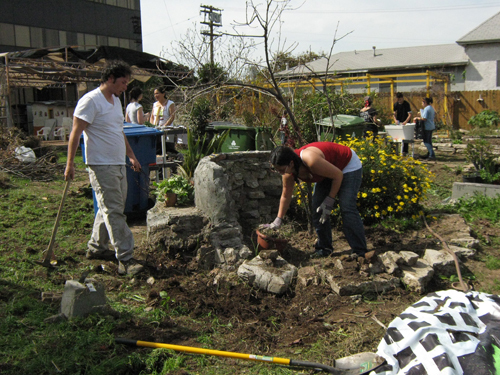 Volunteers and community members helped build the garden, preparing the land for a future of bustling community activity that promotes healthy eating, exercise and self-sustainability. 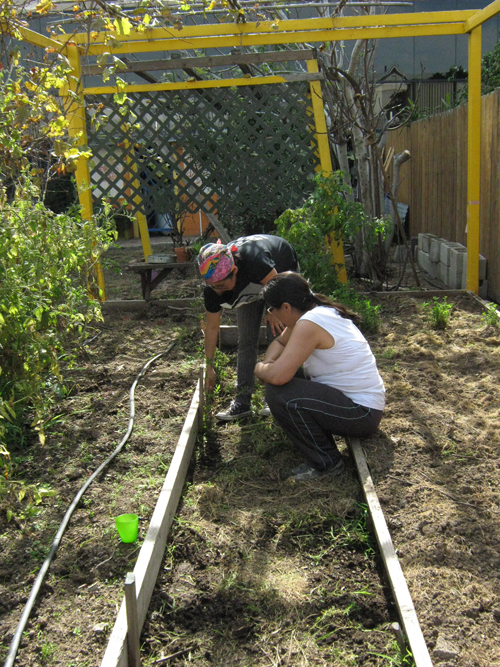 Irene Peña, who helps with grant writing said, “The garden started as a community space where people can work the land collectively and harvest the food amongst them selves.” People volunteer a few hours of their time every week, tending to the garden and planting seeds. 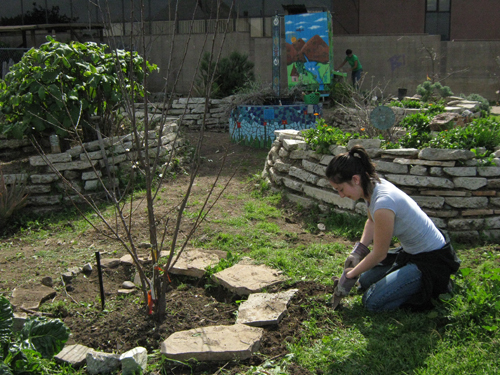 Daisy Tonantzin is one of many volunteers that have helped the garden grow into a vibrant community space. Tonantzin first heard about the garden through friends after moving to Boyle Heights. She wanted to have access to various holistic herbs that she couldn’t grow at home and didn’t want to go to other parts of town to find what she needed. The garden filled her desire and need to grow all the herbs and plants she wanted. She realized the importance of promoting and preserving traditional forms of healing and farming in a society that prioritizes buying manufactured products at stores, rather than people growing them for themselves. “It was an extension of my life. Now it’s more about promoting and preserving traditional forms of healing,” said Tonantzin. Tonantzin has been teaching workshops at the garden on sharing knowledge and learning to live off the earth by growing your own food and even the use of medicinal herbs. Tonantzin, whose line of natural massage oils and fragrances called Yerberia Mayahuel, is a business venture that took root at the garden. People have come to love her line because it’s a green product, it’s locally owned and nothing goes to waste. Tonantzin also helped establish one of the gardens monthly artesian sales, “The Caracol Market Place.” Held the last Sunday of every month, local vendors go to the garden to sell hand made products that range from jewelry to art while enjoying good food. The market place not only attracts community residents who may not know about the garden, it also helps sustain itself, as vendors give donations to help pay for the utilities and keep its doors open. The garden also offers capoeira classes three times a week to promote physical fitness and health. Tim “Omola” Michaels teaches the class, which is held Mondays, Wednesdays from 7 to 9 p.m. and on Saturdays from noon till 3 p.m. Michael first came to the garden after hearing about it from friends and when the need for a fitness program came up, he volunteered to teach capoeira classes in between his busy schedule. “The community is really welcoming and people are happy to find a great activity close to them,” said Michael. “I love the neighborhood, location and the cross-section of people that the garden pulls. The garden not only opened its doors to community residents, but also to Bridge Street Elementary School, which is across the street from the garden. Charles Carrillo is one of three teachers at Bridge Street Elementary School that use the garden once a week for class exercises, while teaching the children about nutrition and the type of work that goes on in the garden. Carrillo has incorporated an exercise routine that his class enjoys on the gardens ample and soft exercise mat. The kids are also given hands on lessons on vegetables grown in the garden, what kind of vitamins they have and how delicious they taste. Now with the recent winter break Peña says the garden has, “fallen into a little disrepair and neglect.” She explains that just like the seeds that were first planted and later grew, so have the people who have been with the garden since it was opened. “People and staff that were heavily involved in the garden before now have major commitments. “They were like little plants, but through their association with the garden, they were inspired and motivated to take lessons learned there, visions that were planted in their minds and they out grew themselves,” said Peña. The lack of structural organization has also hurt the garden, but Peña says that all of those problems have now been addressed as the garden is applying for bigger grants to help it stay open and expand. 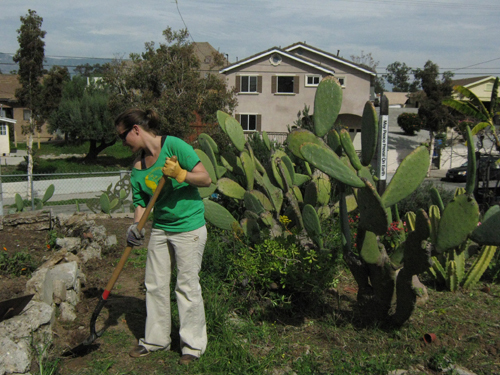 Thus far, the garden has gotten the Los Angeles Neighborhood Initiative grant and the Community Beautification grant, which have been instrumental in helping the garden with repairs. As more grants come in, Peña wants to make sure that a community liaison is at the garden fulltime, along with regular hours of operation so people can come and go from the garden on a regular basis. 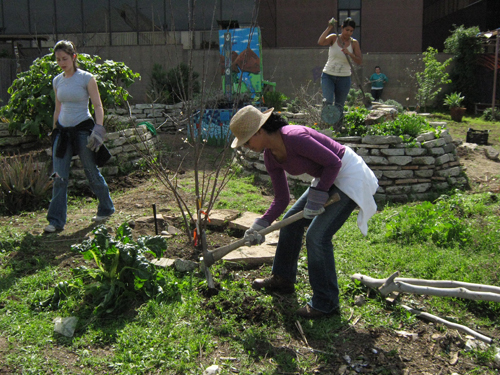 With a person at the garden, anyone can go and volunteer or just stop by, thereby letting the community know that the garden is open for everyone to use. Now with spring around the corner, the garden is coming back to life thanks to the help of fresh faces like Mercedes Castillo and her friend Eli Holland. They both helped out last week at one of the gardens clean up days by preparing the soil for the coming spring harvest. 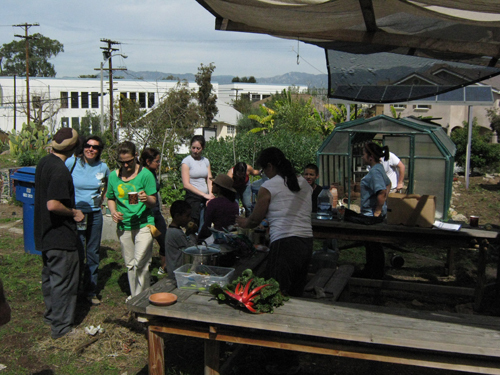 Castillo heard about the garden after Tonantzin gave a lecture about medicinal herbs in her psychology class at Cal State L.A. Having been with another community garden in Pomona, Castillo decided to get involved at Proyecto Jardin because she enjoys giving back to the community. ~ Click here to see a video of the 2008 Peace and Dignity Run that came through the garden. ~ Go here to see a video documentary about the garden. You gotta look for it though. This entry was posted in culture, East Los, Eastside, Greater Los Angeles and tagged boyle heights, Caracol Market Place, proyecto jardin by El Random Hero. Bookmark the permalink. Really nice post! The area around there was my old stomping grounds, my dads family lived on Echandia for 60 years. I used to volunteer at the garden when it first opened and planted some wildflower seeds I had collected on a trip to Oaxaca. It was pleasing to watch the successive generations flower and re-seed. Anyways, like others, eventually my commitments were pulled towards other projects and I moved on. I’m always happy to see the garden thriving and improving. It’s a really beautiful space and Daisy deserves a lot of the credit for keeping the energy going. This is one of my favorite places in Los Angeles. Its helped me grow throughout the years, and I have made some special bonds with people because of the many activities that have taken place there. We need more spaces like it! I agree with Chimatli, Daisy has been key in the survival of the garden. Great post! That is one of my favorite places in LA.